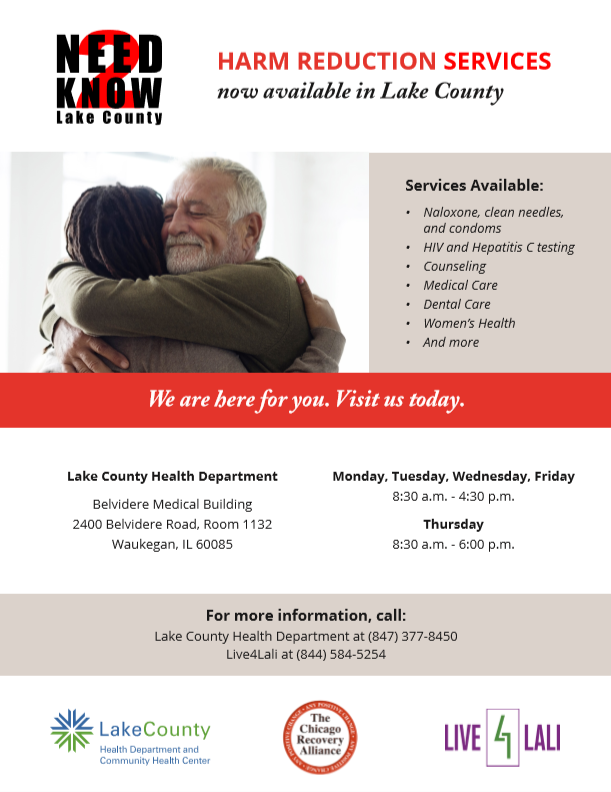 In an effort to reduce overdose deaths, HIV and Hepatitis C transmissions, illnesses associated with substance use, and barriers to treatment, Live4Lali invites drug users, individuals in recovery from substance use disorder and their loved ones/friends to access harm reduction education and supplies at our Community Resource Center (CRC) (3255 N. Arlington Heights Rd, Ste 508, Arlington Heights, IL) or the Lake County Health Department. What are the general goals of harm reduction? Why is the data telling us? In the United States, overdose death is the leading cause of fatality for people under the age of 50. In 2015, IDPH reported a 200% increase in Hepatitis C prevalence among 15-29-year-olds, and a rate of 38 HIV disease diagnoses per every 100,00 people with 42% of new cases affecting people under age 30. According to Roosevelt University’s Illinois Consortium on Drug Policy, the Chicago Metropolitan Area ranks highest for both emergency department mentions for heroin and number of individuals who were arrested and tested positive for heroin. The state of Illinois is the 3rd worst state in the country for funding treatment for opioid use disorder. What types of harm reduction strategies is Live4Lali promoting? For information about accessing Live4Lali’s harm reduction services contact Laura Fry at [email protected] or 844.LV4.LALI (584.5254) x803.